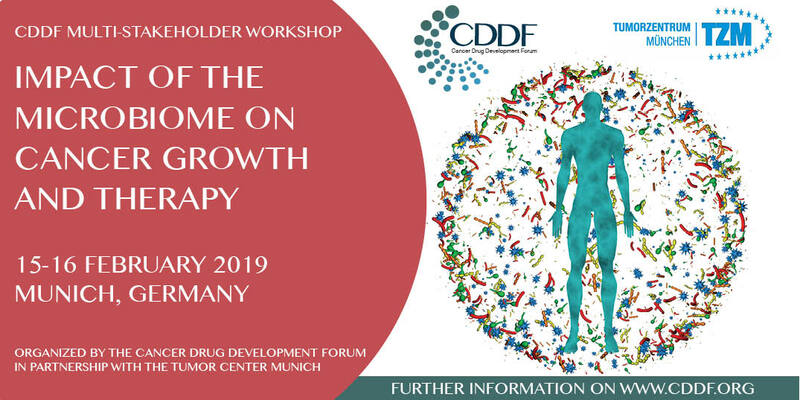 The CDDF multi-stakeholder workshop on Impact of the Microbiome on Cancer Growth and Therapy is organized by the Cancer Drug Development Forum (CDDF) in cooperation with the Munich Tumour Centre (TZM), with the aim of enhancing the understanding of the human microbiome and its critical role in cancer growth and treatment. The first edition of this workshop will be held on 15/16 February 2019 in Munich, Germany and provide comprehensive insights into the human microbiome and its application to cancer research as well as valuable opportunities to establish network in the emerging microbiome field. It will offer small group lectures and interactive discussions to effectively exchange expertise and broaden perspectives. The lectures will focus on the links between the human microbiome and cancer with a special attention to inflammation and immune system. The target audience is a multi-disciplinary community of researchers, medical oncologists, nutritionists and other healthcare professionals, representatives from pharmaceutical, nutrition and biomedical industries, patient advocates, and students who have a keen interest in microbiome research. For more information, please visit the CDDF event page. Academics	250 EUR Industry Representatives	1100 EUR Patient Advocate (*) / Students (**)	120 EUR Representatives from regulatory authorities, policymakers	150 EUR Conference dinner for registered delegates	To be confirmed.